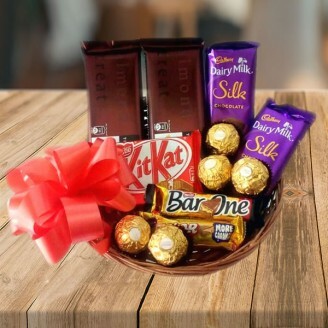 Delight the chocolate lover in your life with this classic chocolates gift basket! No one can resist the temptation of devouring a mouth watering and delicious chocolate. It gives a heavenly feeling. Treat your family and friends to delicious chocolates. Old, young and small kids all are allured and fascinated to a basket of chocolates that has been best owed on them as a precious gift. You can get a mouth-watering chocolate for your best friend, relative, parents or siblings and make your bond sweeter. Diabetic should take distinct care while consuming these chocolates. Remove the wrapper properly as children can put them in mouth. Delivered product may differ to some extent from the image shown above. You can increase the number of chocolates as per your needs and requirements.